THIS POST MAY CONTAIN AFFILIATE LINKS. PLEASE READ MY DISCLOSURE. Working a day job is something most of us do, and whether you love it or not, there is no other option. What if I had told you, you can make money from the things that you love to do like your hobbies. Yes, you can make a good side hustle of your hobbies. Whether it is stamp collection, selling, gardening, sports, gaming, crafting, you name it, and there is some way you can make money from it. It could be just some extra cash or something which can replace your primary income or a side business. Wouldn’t it be great to do something you love so much and still get some income out of it? I am going to list some hobbies which can be great side hustles, and some of them are my hobbies. Ok, this is my favorite, that’s why it’s coming up first. Of all the hobbies, photography can be very fetching with digital era coming into the picture. Did you ever notice lovely images in blogs? They are stock photos. With so many blogs launching every day, there is a continuous need for pictures. Stock photography sites like Shutterstock, iStockphoto, Pexels and websites like Snapwire make it easier for you to sell your stock photos. Though it is hard to get into stock photography, you can still make some money from it. You can make anything between $5 – $300 per image when selling on some websites. And, this is just one type of photography. Big brands are always browsing these websites for images. If you want to pursue this further, you can do direct client selling when you become a pro. Here is the list of microstock photo websites from Everything Microstock. If you are just starting and want some ideas or tips, try Digital Photography School. It is an absolute favorite photography resource. Tools to start – Digital camera (I have Nikon D80), tripod and lens. I don’t think you need more than this when you are just starting. Blogging is my recent favorite and my latest income earner. Starting a blog was my dream for a very long time. I love this medium of interacting with like-minded people, help others from what I have learned. Though it takes some time to establish yourself and monetize, there are many ways you can start seeing some money with your blog like ads, sponsorships, affiliates. I make over $4000 a month blogging part-time from home and you can too. I have a detailed post on how to start a blog where I show you the step-by-step process of starting a money-making blog and share tips to get traffic from the day one. Start your blogging journey today!! 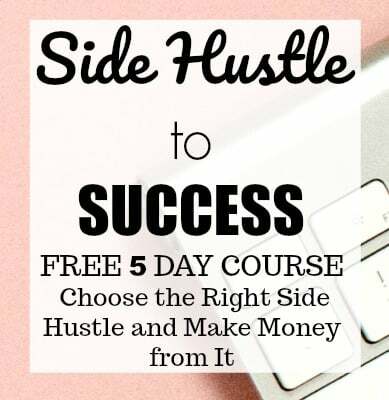 If you want to start monetizing your blog with a sound strategy, Michelle also has the awesome Making Sense of Affiliate Marketing course; I was clueless about affiliate marketing before taking this course. But, now I see a world of difference in my conversions. 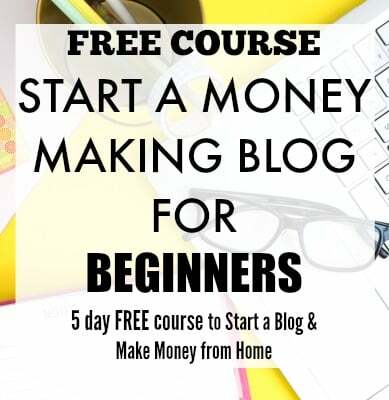 This course is the reason I am already making money with my new blog. Tools to start – To begin with, you would need reliable hosting, theme and an email service provider. If you want to start your blog with a low cost and make money (I make around $4000 a month), then I highly recommend Bluehost. You can start your own blog for as low as $2.95/month (remember this price is only through my link and for a short period of time!). Plus you get a FREE domain when you sign up for 12 month basic plan. ​You can unsubscribe at any time! Are you someone who is always tidying up and organizing things at home? Do you get tons of compliments on how you keep your work space or home beautifully arranged? Do you have this excellent talent of brilliantly organizing spaces? Then you can get paid to do this for others. You can work as a Professional Organizer to creatively tidy up work spaces or residences. You can even get certified for this hobby. All you have to do is learn some tips and tricks for doing the work, but it does pay well. Jeffrey Phillip makes a living out of organizing people’s homes and work spaces. Depending on where you live and your experience you can quote your price, it can start from $50 per hour minimum. If you want some direction to start, have a read at The Life-Changing Magic of Tidying Up. If going pro is something you want, then these courses might be of help. Tools to start – You would a need a basic set up of a home office and get the word out about the business, and you can take it from there. Do you love driving? The best part is that there is a way you can make money while driving. You can be an Uber driver, and it is completely FREE to sign up. It is entirely flexible and can give you an extra option to make money from your car. It can be a great part-time option for you if you have a couple of hours free in your day. I have heard from many of my friends who drive with Uber part-time on weekends, and they make anywhere around $19 to 23 an hour. Another extra money making opportunity is UberEats; this can be a good side hustle for students who are looking for extra income. The minimum pay per delivery is $3 which can make around $10-20 an hour. Tools – You would need a good car or a two wheeler in good condition. Cooking is the most popular of the hobbies and may be the most suitable form to make money. If you are that person who can whip up tasty dishes effortlessly, then you are going to be making nice cash on the side. Do you know Lindsay from Pinch of Yum started her blog because she loved to cook as a hobby? Now she makes more than $50,000 a month pursuing her hobby. Apart from cooking, baking is something which is creating waves in the food world. You might need a license to take this up as a business. Personally, I know many who work from home and have this excellent baking business. I paid $150 for my daughters birthday cake which I had ordered from a friend who bakes at home. That’s for 2 hours of baking!! Tools to start – A basic cooking/baking set up. Ok, making money from crafts is something which has been around for a long time. People sell a lot of stuff like kids clothes, antiques, cards anything that is crafty. There are so many marketplaces where you can sell your things like Etsy, Ebay and Amazon. Especially, Etsy is something which is very profitable for handmade or crafty things. Most of the crafty hobby stories which turned into businesses started from home. Susan Petersen of Freshly Picked started making moccasins for her son picking up raw materials from yard sales. She sold her first moccasins on Etsy and now she has multi-million dollar business. She sold her first pair of mocassin for $20. Whether it is sewing, making blankets, making shoes for your kids, card making, you can give a shot at making it big. Tools to start – Craft supplies suitable to your hobby. Everybody loves shopping, even men!!! Are you surprised to know that this is on the list too?? You can surely make money from your favorite hobby. There are a couple of ways you can see some cash coming in from this. If you love shopping in general, then doing mystery shopping is ideal for you. Companies are ready to pay mystery shoppers to find out about their products and services. Market Force, Trendsource and Best Mark are some of the legitimate mystery shopping companies. If you have an eye for a deal and like buying things for less and selling them for a higher price, then you can look at this as a good side hustle. People are making huge money selling on Ebay and Amazon. Take your game to the next level by signing up the FREE 7 day course from The Selling Family, it is a super helpful course with tips on how to sell on Amazon. Jessica makes $100,000 a year with Amazon FBA. Let’s start that deal hunting!! Tools to start – Inventory, if you are buying and selling. Tutoring is another hobby from which you can make some money if you are on the right path. Do you how many online tutoring websites are there now? There is massive demand for teaching, whether it is languages or subjects or any particular skill. If teaching part time is your thing, then you can look for tutoring gigs in Tutorvista.com, Tutor.com, VIPKID. Many entrepreneurs started teaching something they love as a hobby, and now they are earning a 6-figure income. Phil Ebiner is one such entrepreneur who earns a reliable income from his online courses. The platforms you can use to start promoting and selling your tutoring skills is Udemy, Skillshare. Udemy is known for very niche courses, and it has been very profitable for many people. Tools to start– For online courses, some software like Teachable, Screenflow. I never knew this. Earning money by simply playing games, Wow that sounds fantastic! You just have to upload your game play to streaming service providers like Twitch. Your followers get to watch, comment and you make money from the ads. Gaming is quite a rage these days with more and more games releasing and more gaming apps. Though earning money from this does not happen right away, this is a very fun way of making some cash from your hobby. Tools to start – A gaming set up like a computer, high-speed internet (if you don’t already have one), register for the streaming services like Twitch. Everyone loves to network and socialize. If you are people’s person, and love networking and know the tips and tricks of social media, then why not earn some bucks for it? There are a couple of ways you can make money for being popular socially. If you are on social media and have a good following, then you can get paid from sponsors or brands to post on your social media channels. One such company which pays you for your posts is SocialSpark. You can earn depending on your interests and the number of your followers. If you want to make a bigger impact then consider starting your freelancing gig as a social media consultant, this is totally in high demand now. You can try looking for some freelancing projects in places like Upwork, Freelancer. Tools to start – Register with SocialSpark, Massivesway, Upwork and Freelancer. I am not a writer myself. But, I take help of tools like Grammarly to make my writing better. And, believe me, writing has become my passion now. I have many friends who like to write, and this can become a good side hustle for them. If you love writing, then consider looking for writing gigs in places like Babble, Great Content, Hire Writers. But if you want to see if your hobby has a potential of making more money, then try starting your own freelance writing side business. Gina Horkey of The HorkeyHandbook has a FREE course to Kickstart your freelancing writing career in 5 days. She began her freelancing career in 2014 and within six months she was making $4000 from all of her freelancing hustles. So, what are you waiting for, go ahead and give it a shot? Tools to start – Invest in good courses if you want to advance in the freelance writing business. These are some of the hobbies that can be monetized. If you want to see some good money coming from your hobbies, then invest in yourself and get educated about the business side of the hobby. That will go a very long way in making your hobby a successful business. Get 5 free tips on how to land your first work-at-home job and sign up to our newsletter! What hobbies do you have? Have you ever thought of making money from them? This is an awesome list! I’m all about side hustles, jobs that allow you to follow your passions, and working on your own terms. Have you tried all of these? Thanks:-) Isn’t is awesome to follow your passions and still make money!!! I am trying blogging and love it:-). I love photography, it’s my favourite hobby. Great content and advice. I checked out some of the links. Thanks! I keep seeing baking and cooking listed on various blogs and articles as a means to make money, but where I live you have to have your kitchen/home inspected & approved by the health department and get a license to sell food you cook to the public…you cannot even sell at a flea or farmers markes without a license! I am sure mine is not the only community with these restrictions! I am sure you will need a license to sell food if you are considering this as a business. But if you are blogging about food or recipes, then I believe no license is required. These are great ideas for some additional income! Glad you liked the post!! I got inspired by this entry. I have a blog, and a lot of different ideas, interests and passion. I just don’t know which to focus on as well as if it will interest people. Where did you get your market/audience? Thanks!! Writing about what you absolutely love is definitely the answer. I have reached out to others like me, who want to work from home in many places like forums and groups. great points u got here. recently i started to use sites like koocam, and u really made me think about few points to improve. thank u, very nice article. © Crowd Work News | All Rights Reserved.